Corporate bonds (also called corporates) are debt securities, similar to an IOU, issued by private and public corporations. They are issued, typically in multiples of $1,000 or $5,000, to raise funds for various purposes, from building new facilities to purchasing equipment to expanding a corporation’s business. Unlike stocks, which represent an ownership interest, bonds do not give an investor equity in the issuing corporation. Instead, when you buy a corporate bond, you lend money to the corporation, which promises to return the amount you lent them on a specified date in the future with interest paid on a periodic basis, usually semiannually. When you buy a bond, you are lending money to the corporation that issued it. The corporation promises to return your money (also called principal) on a specified maturity date. Until that time, it also pays you a stated rate of interest, usually semiannually. The interest payments you receive from corporate bonds are taxable. Unlike stocks, bonds do not give you an ownership interest in the issuing corporation. 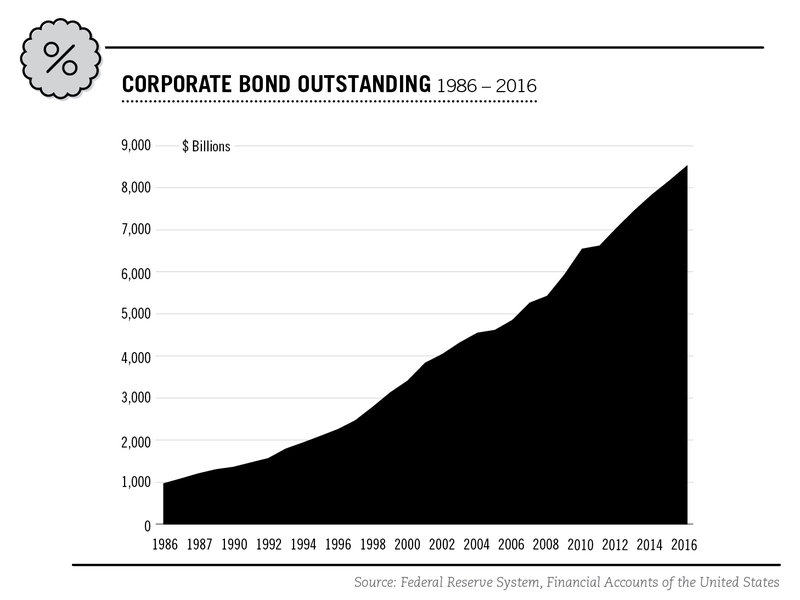 How Large is the Corporate Bond Market? Corporate bonds are issued by a wide range of entities from virtually every private sector of the economy, as well as by public utilities. Corporate bonds can be issued by US-based and foreign corporations. Most corporate bonds trade in the over-the-counter (OTC) market, rather than on a centralized securities exchange such as the New York Stock Exchange (NYSE). Instead of trading in a central physical location like an exchange, the OTC market consists of dealers and brokers around the world trading bonds electronically and via telephone. In 2016, issuance of non-convertible corporate bonds totaled $1 5 trillion and average daily trading volume was an estimated $30 0 billion. 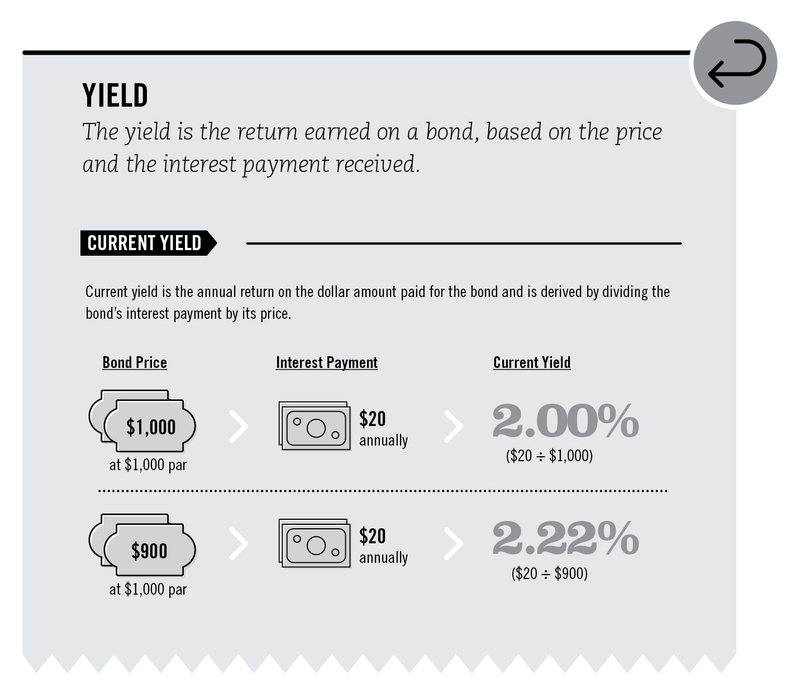 The yield is the return earned on a bond, based on the price and the interest payment received. Corporates typically offer higher yields than comparable-maturity government bonds. This higher-yield is, however, generally accompanied by higher risks. For more information on yields, refer to Understanding yields. Investors seeking steady income in the form of interest payments, while preserving their principal, may include corporates in their portfolios. Corporate bonds allow investors to choose from a variety of sectors, structures and credit-quality characteristics to meet a wide range of investment objectives. If you must sell a bond before it matures, in many instances you can do so relatively easily and quickly because of the size and liquidity of the market (refer to Marketability, on page 20). A bond’s maturity is the date when the principal amount (the total initial purchase price, or face or par value) of the bond is due to be repaid, and how long you can expect to receive interest payments. Corporate bonds can be issued with maturities that are short term (up to five years), medium term, or long term if more than 12 years. Note, however, that some corporates have “call,” or redemption, features that may affect the date your principal is returned. Refer to Understanding “calls” and other redemption features. Before you buy a bond, be sure you understand its structure, which details how you will be repaid. With traditional fixed-rate bonds, the investor lends the issuer, or corporation, a specified amount of money for an agreed period of time. In exchange, the investor receives fixed interest payments on a regular schedule for the life of the bond, with the full principal returned at maturity. Floating-rate. These bonds have variable interest rates that are adjusted periodically according to a reference rate, such as an index tied to short- term Treasury bills or money market rates. These bonds offer protection against rising interest rates, but their yields are typically lower than those of fixed-rate securities with the same maturity and will underperform if interest rates fall. Refer to Understanding interest-rate risk. Zero-coupon. Interest payments are referred to as coupon payments and zero-coupon bonds, also called “zeros,” do not make periodic interest payments before the bond matures. Instead, a zero-coupon bond is sold at an initial purchase price and then redeemed as a single payment, which includes principal and interest, at maturity. Interest-rate risk is the risk that the value of a bond will fluctuate as a result of a change in the level of interest rates. Like all fixed rate bonds, fixed rate corporates rise in value when interest rates fall, and they fall in value when interest rates rise. If you sell your bond before maturity, it may be worth more or less than what you paid for it depending on prevailing interest rates, among other factors. When interest rates rise, new bond issues come to market with higher coupons than older bonds – making those older, lower coupon bonds worth less. Hence, the prices of the older bonds go down. When interest rates decline, new bond issues come to market with lower yields – making those older, higher-paying bonds more valuable. Hence, their prices go up. This relationship is the key to understanding how to compare bonds with different coupon rates by looking at their yields Refer to Understanding yields. Yield is the rate of return on your bond investment (based on the price and the interest payment received), and is a critical concept in bond investing: yield is used to measure one bond’s return against another, and enables you to make informed decisions about which bonds to buy. Yield differs from a bond’s stated interest rate; yield changes to reflect the bond’s price movements caused by fluctuating interest rates. After you purchase a bond at face value, prevailing interest rates may rise during the term of the bond causing the market price of your bond to decline, as newer bonds are issued with higher rates. This, in turn, results in a lower price if you decide to sell. There are many ways to measure yield, but two types of yield — current yield and yield to maturity (or call) — are of greatest importance to most investors. The current yield is the annual return on the dollar amount paid for a bond, regardless of its maturity. If you buy a bond at par, the current yield equals its stated interest rate Thus, the current yield on a par value bond paying 2 00% is 2 00%. However, if the market price of the bond is greater than or less than par, the current yield will be different. For example, if you buy a $1,000 bond with a 2 00% interest rate after prevailing interest rates have risen above that level, you would pay less than par Assume your price is $900. The current yield would be 2 22% ($1,000 x 02 ÷ $900). Because current yield does not consider the maturity of the bond, it is of limited help when comparing bonds of different maturities. A more helpful measure is the yield to maturity because it tells you the total return you will receive if you hold a bond until maturity. It also enables you to compare bonds with different maturities and coupons. Yield to maturity includes all interest payments plus any capital gain you will realize (if you purchase the bond below par) or minus any capital loss you will suffer (if you purchase the bond above par). The yield to call indicates the total return you would receive if you were to buy and hold the security until the call date. This yield is valid only if the bond is called prior to maturity. The calculation of yield to call is the same as the yield to maturity – except it includes only the interest payments until the call date and gains or losses you would experience to the call price (which may or may not be par). Refer to Understanding “calls” and other redemption features, on page 12. Important risks that investors should understand include those posed by redemption features such as a call provision and refunding provisions. If the bond’s indenture (the legal document that spells out its terms and conditions) contains a “call” provision, the issuer retains the right to retire (that is, repay) the debt, fully or partially, before the scheduled maturity date. For the issuer, the chief benefit of such a feature is that, if interest rates fall, it permits the issuer to replace outstanding higher coupon debt with new bonds at a lower interest rate—thereby lowering its cost of borrowing. A call feature creates uncertainty as to whether the bond will remain outstanding until its maturity date. When a bond is called, the investor usually has to reinvest in securities with lower yields. Also, in a falling interest rate environment, call features tend to limit the appreciation in a bond’s price that would otherwise be expected. Because a call feature puts the investor at a disadvantage, callable bonds are generally higher yielding than non-callable bonds, but the higher yield alone is often not enough to induce investors to buy them. As further inducement, the issuer often sets the call price (the price investors must be paid if their bonds are called) higher than the par (face) value of the issue. The difference between the call price and par is the call premium. Just as some issuers have the right to call your bond prior to maturity, there is a type of bond — known as a put bond — that is redeemable at the investor’s option prior to maturity. At specified intervals, an investor may “put” the bond back to the issuer for full face value plus accrued interest. In exchange for this privilege, bonds with put features typically yield less than a comparable bond without a put feature. A sinking fund is money set aside from a corporation’s earnings to redeem bonds before maturity, as specified in the indenture. If a bond issue has a sinking-fund provision, a designated portion of those bonds must be retired each year. An investor may benefit from a sinking fund, since it lowers the risk of default by reducing the corporation’s outstanding debt over time. However, the disadvantage — which usually weighs more heavily in a falling-rate environment — is that bondholders may receive a sinking-fund call at a price (often par) that may be lower than the prevailing market price of the bonds. Bond investors should be aware of other kinds of calls. Some bonds, especially utility securities, may be called under what are known as “Maintenance and Replacement” fund provisions (which relate to upgrading plant and equipment). Others may be called under “Release and Substitution” clauses (which are designed to maintain the integrity of assets pledged as collateral for some bonds) and “Eminent Domain” clauses (under which bonds are paid off if a governmental body confiscates or otherwise takes assets from the issuer). Investors can avoid the complications and uncertainties of calls altogether by buying only non-callable bonds without sinking fund or other redemption provisions. If you do consider buying a callable bond, be sure to check the yield to call. Ask your financial professional about calls and other redemption provisions that may apply to bonds you are considering. In the event a corporation goes out of business or otherwise defaults on its debt, bondholders are creditors—which means they have priority over stockholders in bankruptcy court if there are assets to be distributed. The order of priority among all the vying groups of creditors depends on the specific terms of each bond, among other factors. One of the most important factors is whether the bond is secured or unsecured If a bond is secured, the issuer has pledged specific assets (known as collateral) that can be sold, if necessary, to repay the bondholders. If you buy a secured bond, you will “pay” for that security by receiving a lower interest rate than you would have received on a comparable unsecured bond. Most corporate bonds are debentures — that is, unsecured debt obligations backed only by the issuer’s general credit and the capacity of its cash flow to repay interest and principal However, even unsecured bonds usually have the protection of what is known as a “negative pledge provision.” This requires the issuer to provide security for the unsecured bonds in the event that it subsequently pledges its assets to secure other debt obligations. You can use credit ratings (discussed under Understanding credit risk, on page 17) to help assess the quality of a company’s unsecured bonds. Mortgage bonds are debt securities for which real estate or other physical property has been pledged as collateral They are primarily issued by public utilities. There are various kinds of mortgage bonds, including the following: first, prior, overlying, junior, second, third, and so on. The designation reflects the priority of the lien, or legal claim, you have against the specified property When investing in mortgage bonds, investors should find out how much of the issuer’s other debt is secured by the same collateral, and whether the lien supporting that other debt is equal or prior to your bond’s lien. A corporation may back its bonds by depositing stocks, bonds, and other securities with a trustee A bond trustee is typically a financial institution with fiduciary powers, which are assigned by a bond issuer to enforce the terms of a bond indenture. The indenture is a legal contract between a bond issuer and a bondholder that describes the terms of the bond, including important features of the bond and when interest is paid. The collateral must have a market value at least equal to the value of the bonds at the time of issuance. Another form of security is a guarantee of one corporation’s bonds by a separate corporation For example, bonds issued by a subsidiary may be guaranteed by its parent corporation Or bonds issued by a joint venture between two companies may be guaranteed by both parent corporations. Guaranteed bonds become, in effect, debentures of the guaranteeing corporation, and benefit from its presumably better credit. Debt that is subordinated, or junior, has a priority lower than that of other debt in terms of payment (but like all bonds, it ranks ahead of stock) Only after secured bonds and debentures are paid off can holders of subordinated debentures be paid. In exchange for this lower status in the event of bankruptcy, investors in subordinated securities earn a higher rate of interest than is paid on senior securities. Credit risk is the risk that a borrower may not repay its debt, including the principal amount and the interest owed. A bond investor should give special consideration to an issuer’s ability to pay its debts — that is, make all scheduled interest and principal payments in full and on time. Most corporate bonds are evaluated for credit quality by ratings agencies like Standard & Poor’s, Moody’s Investors Service, and Fitch Ratings. Ask your financial professional for information on a bond’s rating, or check it out online at www moodys com/page/lookuparating aspx, www fitchratings com/site/corporates and/or www standardandpoors com. 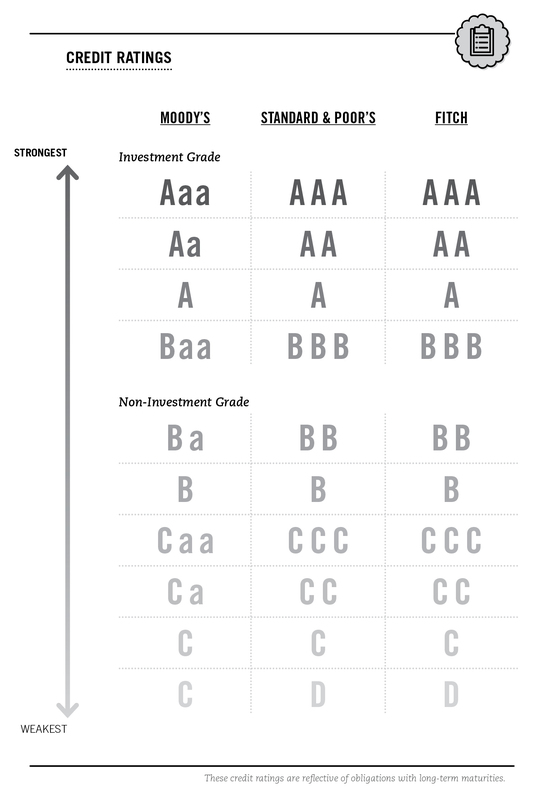 Bonds rated BBB or higher by Standard & Poor’s and Fitch Ratings, and Baa or higher by Moody’s, are widely considered “investment grade.” This means the issuer is considered able to meet its obligations with minimal risk of default. Bonds with a rating of BB (Standard & Poor’s, Fitch Ratings) or Ba (Moody’s) or below are considered more speculative investments and are known as high-yield bonds. High-yield bonds are frequently issued by newer or start-up companies, companies that have had financial problems, companies in a particularly competitive or volatile market, and those with more aggressive financial and business policies. They pay higher interest rates than investment-grade bonds to compensate for the higher risk of default. Event risk is the risk of an unforeseen event taking place and its impact on an investment. An unforeseen corporate action – such as leveraged buyouts, restructurings, mergers, and recapitalizations – as well as natural disasters and geopolitical risk, among other events, could have a negative impact and push bond values down, sometimes very suddenly. Although some corporations have now established bondholder protections, these are neither widespread nor foolproof An example of a bondholder protection is a puttable bond, which is a bond that allows the bondholder the right (but not the obligation) to request that the issuer repurchase the security at specified dates before maturity. Credit rating agencies may write in their publications about certain companies’ vulnerability to event risk; refer to Sources of information. An alternative to buying individual corporate bonds directly is to invest in bond mutual funds instead (or in addition to) individual bonds. Bond mutual funds offer diversification, professional management, modest minimum investments, automatic reinvestment, and other convenient features. Diversification is an especially important feature of bond funds. Many investors in individual bonds buy only a few securities, thus concentrating their risk. A fund, by contrast, can hold a wide variety of bond issues. A diversified portfolio will likely include bonds from different issuers and sectors, with a range of credit ratings, coupons, and maturities. All the underlying risks that affect individual bonds also affect bond funds. You should be aware that prices of bond fund shares fluctuate inversely with interest rates, just as individual bonds’ prices do, and when you sell fund shares, they may be worth more or less than what you paid for them. The interest you receive from corporate bonds is subject to federal and state income tax. Capital gains taxes may apply if you sell your bond for a profit prior to maturity or purchase your bond at a discount. SIFMA does not provide tax advice, and this is not intended to be a substitute for a consultation with a tax professional who knows the characteristics of the bond and your tax circumstances. You should always consult with a tax professional when considering an investment in fixed income securities, such as corporate bonds. Corporate bond interest is usually paid semiannually. Zero-coupon bonds pay no periodic interest; all interest is paid upon maturity (or call). Book-entry bonds. These are bonds for which certificates are not issued. 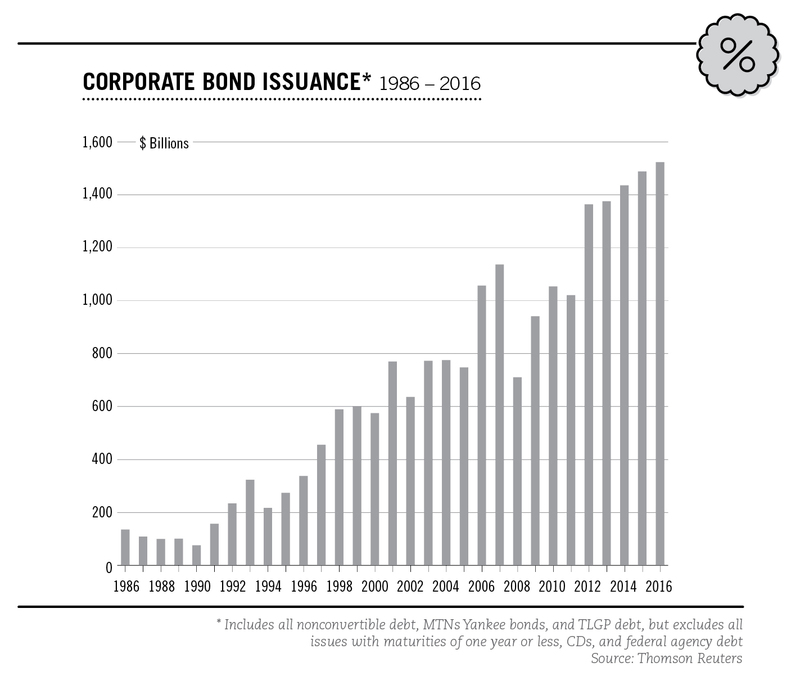 Just as registered bonds have largely supplanted bearer bonds, book entry has replaced certificates as the prevailing form of issuance. With book-entry securities, a bond issue has, generally, only one master, or global, certificate, which is kept at a securities depository. The investor’s ownership of book-entry bonds is recorded in the investor’s brokerage account. The broker, in turn, holds a corresponding interest in the global certificate that is held by the depository. All interest and principal payments are forwarded to the depository, and from there to the investor’s brokerage account. A copy of the prospectus, the official offering statement the issuer must file with the Securities and Exchange Commission (SEC), may be obtained from a financial professional or online at www sec gov/edgar/searchedgar/companysearch html. In addition, detailed information on new bond issues is provided by two of the rating agencies: Moody’s (www moodys com/page/lookuparating aspx) and Standard & Poor’s (www standardandpoors com). These two companies also provide information on existing bond issues. How quickly and easily a particular bond can be bought or sold in the secondary market determines its marketability. The term “marketability” may be used interchangeably with “liquidity.” In general, for a bond to have high marketability, there must be a large trading volume and a large number of dealers in the security. Bearer bonds. The Tax Reform Act of 1982 ended the issuance of new bearer bonds in the United States. These bonds had no name printed on them, and had coupons attached. Anonymous and highly negotiable, bearer bonds were virtually equivalent to cash. Call provision. Bonds may have a redemption, or call, provision that allows or requires the issuer to redeem the bonds at a specified price and date before maturity. For example, bonds may be called when interest rates have dropped significantly from the time the bond was issued. Collateral. Assets pledged by a borrower to secure repayment of a loan or bond. High-yield bond (or junk bond). Bonds rated Ba (by Moody’s) or BB (by S&P and Fitch) or below, whose lower credit ratings indicate a higher risk of default. Due to the increased risk of default, these bonds typically offer a higher yield than more creditworthy bonds. Interest. Compensation paid or to be paid for the use of assets, generally expressed as an annual percentage rate. The rate may be constant over the life of the bond (fixed-rate), or may change from time to time by reference to an index (floating-rate). Security. Collateral pledged by a bond issuer (debtor) to an investor (lender) to secure repayment of the loan. Volatility. The propensity of a security’s price to rise or fall sharply. Zero-coupon bond. A bond that does not make periodic interest payments before it matures. Instead, the investor receives one payment, which includes principal and interest, at redemption (call or maturity).